Aircraft batteries have a shelf life and maintenance requirements while in storage. The maintenance intervals and level of maintenance are directly related to the temperature at which the batteries are stored. As an authorized BendixKing service center, we have seen this system in our avionics repair shop many times. According to the most recent data from the FAA, slightly less than 10% of all U.S. registered ADS-B-equipped aircraft are NPE, or non-performing emitters. Duncan Aviation has a large selection of business aircraft for sale. View the latest offerings for 2018 and see what is coming soon. Are you aware of the reletively new 7X task card 53-60-00-900-601? No? Then you haven't read the September issue of the Duncan Intelligence. Duncan Aviation Falcon technicians have noted a few Falcon 7X aircraft with screws pulling through the composite fuselage body fairings. Whenever access to the upper surfaces of your aircraft is possible, inspect and remove minor corrosion. During recent inspections, Duncan Aviation Accessory Technicians have found corrosion on the pistons in the Main Actuator of a Bombardier Learjet 55 aircraft. If your ART 2000 or ART 2100 screen is blank, only showing half a screen, sending you FAIL messages, or creating a noise/vibration when getting powered down, you may not be following proper shutdown procedures. Fly today with a complete solution and prepare for the future with Duncan Aviation's Hawker 800/800XP ADS-B Out STC. 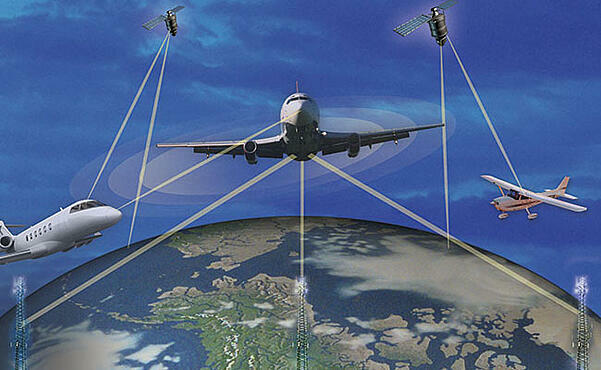 By Jan.1, 2020, all operators must have Automatic Dependent Surveillance-Broadcast capability. As a staple in NextGen technology, ADS-B Out increases efficiency, strengthens situational awareness and allows aircraft to transmit information to Air Traffic Control ground stations by using satellite signals instead of ground radar and navigational aids. As a result, ATC is able to keep your aircraft properly spaced in high-density traffic areas. When you upgrade your existing Honeywell Primus® II Radio and add a stand-alone GPS receiver, you’ll enjoy a cost-effective solution combined with the latest configuration to meet the ADS-B Out mandate. And, when you replace your old CRT display units with LCD displays with Duncan Aviation's ADS-B Out STC, you'll receive two new RMU-855's, designed to increase visibility and seamlessly integrate with your current configuration. Fly with confidence with Honeywell's Primus II Radio equipped with a Mode C transponder to fulfill ADS-B Out requirements and ensure your future travel plans. As an added benefit, Duncan Aviation's ADS-B Out STC offers Hawker 800/800XP operators an exclusive discount on Honeywell's Avionics Protection Plan. Learn more about this offer and upgrade your Hawker 800/800XP with an integrated solution at a Duncan Aviation maintenance facility: Lincoln, Nebraska; Battle Creek, Michigan; Provo, Utah; or at one of their satellite shop locations throughout the United States*. Contact Gary Harpster, Duncan Aviation Hawker Avionics Install Sales Rep. The Hawker 800 / 800XP avionics bay door panels have become the modern aviator’s equivalent to Pandora’s Box. Is there a way to access Hawker 800 / 800XP avionics boxes at a remote location without disturbing RVSM critical areas? Most definitely. Yes. Restoring the RVSM certification for Hawker 800 / 800XP aircraft in-the-field is not for the faint of heart. Talk to the many operators who have landed in remote locations for AOG avionics servicing, only to discover that those locations were not capable of restoring the aircraft's RVSM certification. 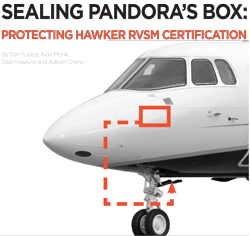 Duncan Aviation explores the issues surrounding RVSM recertification in its updated field guide “Sealing Pandora’s Box,” with details on how to avoid disturbing RVSM critical areas when accessing the avionics nose bay. For Hawker 800 series aircraft, the nose avionics bay access panels are located in a RVSM critical area. This critical area has very tight tolerances for gaps and skin variances as called out by the aircraft’s RVSM Service Bulletin. This significantly increases the ground time required for maintenance and troubleshooting on flight guidance and Electronic Flight Instrument System (EFIS) systems, negatively impacting flight schedules. Even the simple replacement of a Flight Guidance Computer results in the recertification of the RVSM critical zone, including any rework of that area required to meet OEM specifications. Duncan Aviation's field guides are free. They address important topics to business aircraft operators and are written by our very own technical experts. Download now. The Main Entry Door on Hawker aircraft is durable and very reliable. And by adding these basic operational measures, you will ensure years of continued problem-free service. In addition to normal door lubrication, the top and bottom door stay and hinge shaft linkages deserve some attention. Make it a point to keep them lubricated and clean. The use of door support cables during servicing and maintenance will go a long way in reducing wear in the door stays and hinge shafts. The policy of allowing only one passenger on the steps while entering or exiting the aircraft will also help in reducing wear. There are several areas on the Main Entry Door where we have found wear, these include elongated bolt holes in the entry door lever to the entry door shaft and loose rivets in the door stay top and bottom tubes and fork end. Repairs for these items can be found in the Structural Repair Manual. Loose rivets and elongated bolt holes can be readily detected by applying weight to the last step and observing the amount of movement and its location. Prompt detection and repair will reduce the likelihood of costly parts replacement. Dave Ungvarsky is an Airframe tech rep located at Duncan Aviation's Lincoln, NE, location, specializing in the Hawker aircraft. His aviation career began in 1978. Duncan Aviation Parts & Rotables Sales has built and maintained one of the largest business aircraft parts inventory in the industry. Our team of aviation professionals has the experience, contacts and connections to identify and secure some of the hardest to find business aircraft parts. Because of our long history and experience with the Hawker aircraft, we know the most commonly exchanged parts and keep an inventory available to meet customer needs. Below are some of the more commonly exchanged life-limited parts on a Hawker 125 airframe that have been known to not make the next Time Before Overhaul (TBO). Sequence valves are required Overhaul items and have to be overhauled at the required Chapter 5 Interval. However, sometimes they do not make the TBO due to seal failure and contamination of the hydraulic fluid, leading to internal slide and sleeve failure. Starter generators are exposed to a lot of abuse while operating in a constantly vibrating environment with lots of heat. These conditions over time take their toll, leading to problems, such as not coming on line, unable to be paralleled and premature brush wear. The Hawker 125 series aircraft utilizes an axle-mounted Maxaret to control skid conditions. It is a required overhaul item and needs to be removed at the necessary intervals. It is not uncommon for valve wear and seal failure to cause leaking, requiring removal before TBO. When removing Maxarets, be sure to use the proper Maxaret extraction tool and procedures to avoid unnecessary damage and expensive overhaul costs. 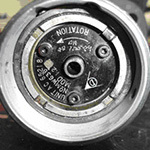 The aircraft uses this bypass valve to regulate cabin temperature to the desired setting. Due to ever-changing cabin temperatures, this valve is always opening and closing. Failures such as inop, slow to operate and does not modulate result in unwanted cabin temperature ranges. Just like the sequence valves, the Airbrake Actuator is a hydraulic unit with many seals. 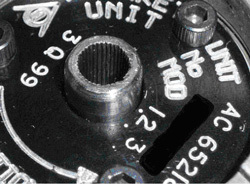 These seals have been known to fail before the next required overhaul interval and may cause the unit to be exchanged earlier. 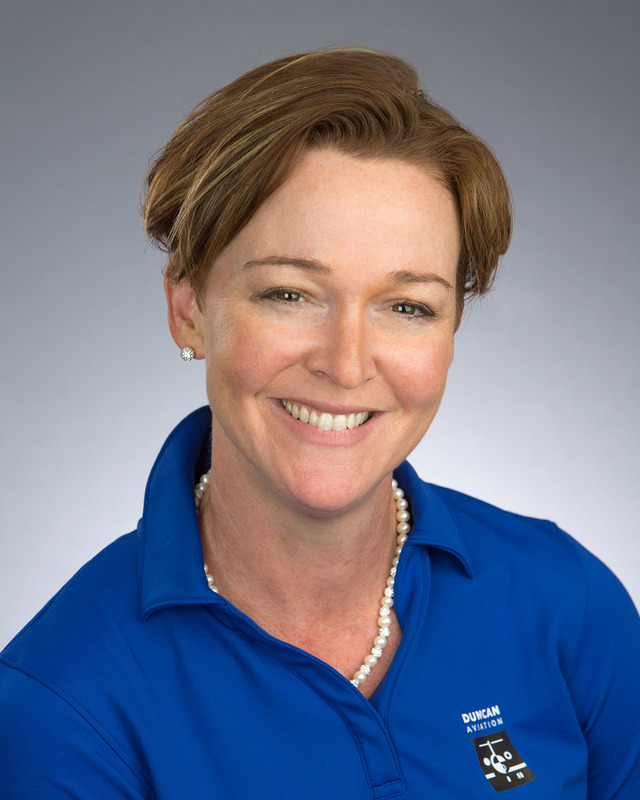 Duncan Aviation is constantly adding to its inventory to ensure customers have a true one-stop shop when it comes to acquiring parts or exchange units. Search our on-line inventory for aircraft parts and inventory availability or chat live with a Parts & Rotables Sales Rep. Our international business aircraft components solutions experts are available 24/7/365 and can handle any business aircraft system problem with immediate parts exchanges. In light of the recent changes in the industry for Hawker operators, I want to remind you that Duncan Aviation continues to provide comprehensive Hawker aircraft service and support at all Duncan Aviaiton locations around the world. We are an industry leader in Hawker maintenance, structural repair, landing gear/component overhauls, engine MPIs, avionics upgrades, paint and interior. Our experience and capabilities are second to none. For more information about your options as a Hawker operator, contact any one of the many Duncan Aviation Hawker experts. Darrell Cermak is a Rotable Inventory Manager located at Duncan Aviation’s Lincoln, Nebr., facility. He specializes in the Hawker 125 and Falcon airframes. His aviation career began in 1995. The Hawker 125 series business aircraft utilizes an axle-mounted Maxaret to control skid conditions. 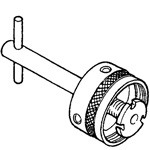 The Maxaret is installed in the axle and is driven by a small splined shaft in the hubcap. These units are required overhaul items and need to be removed at the necessary intervals. To avoid potential bill backs or high overhaul costs, it is recommended that the proper tooling and procedure for removal be followed. The Maxarets are held in place with a retaining nut in the axle. Dirt, debris and rust can also collect in this area creating a tight seal and snug fit. It is tempting to grab a hold of the shaft of the Maxaret with a pair of pliers to yank it free, but doing so will cause damage to the shaft of the Maxaret. The damage could result in the need to replace the shaft if the drive cap can not be installed due to damaged gear teeth. The cost to replace this part is estimated at about $2000. To prevent unnecessary damage, loosen the nameplate bolts and use the special extraction tool engaged under the heads of the bolts. See photo 3. Using this procedure only takes a few extra minutes, but will prevent any damage to the shaft of the Maxaret, avoiding added expense. The Maxaret installation and extraction tool can be purchased from Hawker Beechcraft (part number A125529). Duncan Aviation provides accessory unit repairs and overhauls for the most popular business aviation airframes. We work on tens of thousands of accessory units providing some of the fastest turntimes in the industry and the highest quality of repairs and overhauls. 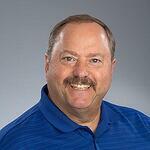 Jerry Cable is an Accessories Tech Rep located at Duncan Aviation’s Lincoln, Nebr., facility. He is a landing gear and accessory components and systems specialist. His aviation career began in 1991. Steel fastener corrosion on the upper surface skin of the wing. 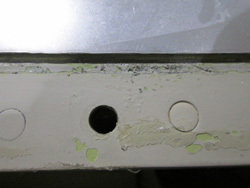 Example of leading edge corrosion after TKS panels have been removed. Properly sealed wing leading edge TKS panel. All aircraft are vulnerable to corrosion due to environmental conditions and the quality of maintenance. The Hawker 125 series is no different, but added vigilance is needed due to its use of TKS Fluid. The condition of protective coatings and paint along with proper maintenance procedures will ensure that corrosion will be kept in check, and additional maintenance costs can be avoided. A thorough eye during a pre/post-flight inspection can detect and prevent several corrosion issues. Below are three areas of a Hawker aircraft that are susceptible to corrosion and should be visually inspected on a regular basis. The condition of the paint on the upper and lower wing surfaces is an area of concern. Hawker aircraft use steel fasteners and if the protective finish/paint is not well maintained on these fasteners, they can corrode and require repair, per a Structural Repair Manual procedure, or replacement. Replacing these fasteners requires entering the wing, which, in some circumstances, may result in fuel leaks. 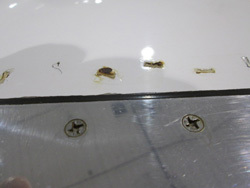 The wing skin around the fastener can also corrode and get real expensive real quick requiring engineering help from the manufacturer for a repair scheme. 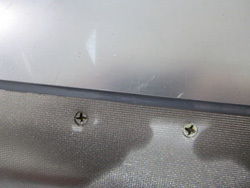 On Hawker 800 or newer aircraft, the joint between the TKS panels and the leading edges are sealed with a filling compound. It is critical to maintain this area to prevent leading edge rebate corrosion. Any indication of cracked or missing filler should be immediately addressed and repaired. If the rebates are allowed to continue to corrode, it will require repair. If left for too long, it will also require engineering help to develop an approved repair. Are you applying the appropriate silicone lubricant (Dow Corning 111) on the trim tab rod ends as spelled out in the Hawker Maintenance Manual? If you are not, you run the risk of TKS fluid entering and corroding the bearing. And if the bearing becomes corroded, it requires replacing. Corrosion is detected by the appearance of a rust colored streaking aft of the trim tab rod ends. The elevator trim rod ends appear to be the most susceptible. However, by the time you see this streaking it is too late. 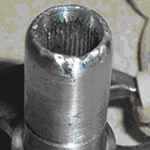 The rod end is already corroded and needs to be replaced. This is not a high dollar item compared to the others but an added expense that could have been prevented. You can't prevent all corrosion, but it can be kept to a minimum when caught early with preventive methods such as careful pre/post flight inspections and prompt remedial action. Feel free to contact me anytime for more information about corrosion detection/prevention methods or any other Hawker technical questions. Duncan Aviation is a business aviation maintenance, repair and overhaul (MRO) facility with a long history servicing the Hawker aircraft. 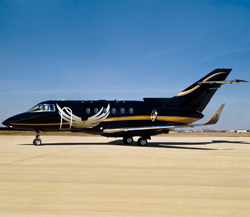 We have comprehensive capabilities on all Hawker models. If your Hawker 800XP's HF system is showing signs of intermittent faults, the solution may be as simple as checking for proper bonding at the antenna and antenna coupler. A Hawker 800XP operator, who was experiencing a squawk on both #1 and #2 HF systems, recently contacted us for support. He was not able to receive transmissions on either system. Since both systems were exhibiting the same symptoms, the obvious place to begin troubleshooting is by focusing on components that are common between the #1 and #2 HF systems. In this instance: the dual KHF-950 HF system with a shunt antenna. The common components are the KA 162 Dual External Capacitor (or KA 160 Dual Antenna Adapter, if it is a long wire antenna installation) and the HF antenna itself. The function of the KA 162 Dual External Capacitor is to connect the antenna to the active antenna coupler. Since the HF antenna in this installation is essentially the vertical stabilizer leading edge, the one thing to check with the antenna is proper bonding. Good bonding of the antenna, KAC 952 Power Amplifier/Antenna Coupler and KA 161 External Capacitor or KA 162 Dual Antenna Capacitor is essential for proper operation of the HF system. I cannot count the number of HF squawks that have been remedied by Duncan Aviation avionics technicians simply by going through and cleaning corroded bonding connections at the antenna or antenna coupler. Tuning faults are also a common squawk for HF systems that have corroded or poor bonding at the antenna or antenna coupler. Bonding at the antenna coupler is done with a bonding strap, and the resistance should not exceed .003 ohms. So if your aircraft's HF system begins to show signs of intermittent faults, take a few minutes to first check for proper bonding at the antenna and antenna coupler. Many times, this can remedy the problem and save you time and money in the process. In light of the recent changes in the industry for Hawker operators, I want to remind you that Duncan Aviation continues to provide comprehensive Hawker aircraft service and support at all Duncan locations around the world. We are an industry leader in Hawker maintenance, structural repair, landing gear/component overhauls, engine MPIs, avionics upgrades, paint and interior. Our experience and capabilities are second to none. For more information about Duncan Aviation’s Hawker Services, contact any one of the many Duncan Aviation Hawker experts. If you have any questions or need assistance when troubleshooting a KHF-950 HF system, contact Duncan Aviation's Avionics Tech Reps, available 24 hours a day, every day. Should Hawker Beechcraft Retain Duncan Aviation as an ASC? 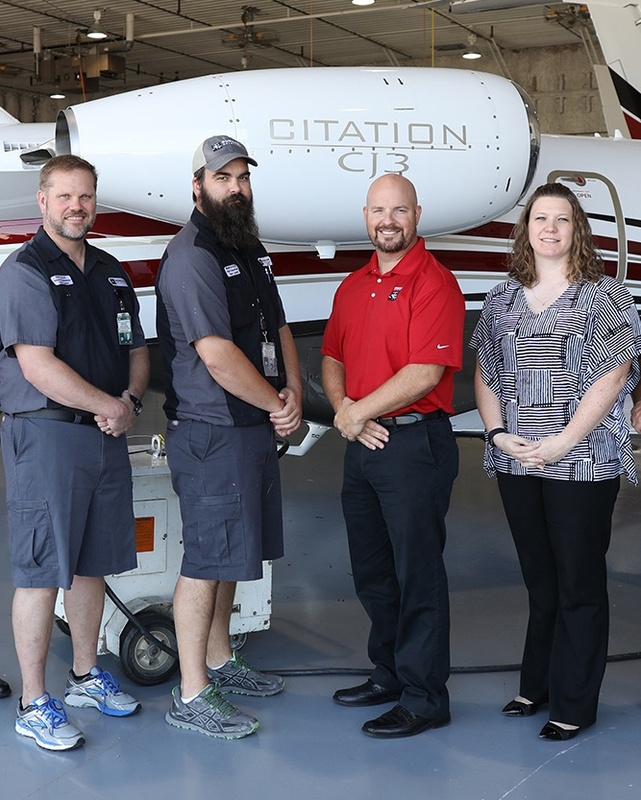 Contributed by Dan Fuoco, Airframe Maintenance Service Sales Rep.
Duncan Aviation was founded as a Beechcraft Distributorship in 1956 and was literally built by serving the Hawker Beechcraft customer. Duncan Aviation continues to provide comprehensive Hawker aircraft services and support for all operators around the world. However, recently Hawker Beechcraft has decided to end our 13 year partnership by not renewing our Authorized Service Center Agreement for our Lincoln, NE, facility. It goes without saying we are disappointed. Several Hawker operators, who rely on Duncan Aviation’s technical expertise and experience, have come to me personally and expressed their frustration with Hawker Beechcraft’s decision. Individually we have opinions, but collectively we can have a powerful voice. If you, as a Hawker operator, feel that Hawker Beechcraft should retain Duncan Aviation as an Authorized Hawker Service Center, contact your Hawker Beechcraft Representative asking them to reconsider their decision. Or you can download this letter addressed to Hawker Beechcraft and complete it to express your support. Email or fax it to me no later than July 31, 2012; whereupon, I will forward all letters to Hawker Beechcraft for their consideration. Since 1999 Duncan Aviation has been a Hawker Authorized Service Center providing tip-to-tail maintenance services to every Hawker make/model aircraft. We are an industry leader in maintenance, structural repair, landing gear/component overhauls, engine MPIs, avionics upgrades, paint and interior. Our experience and capabilities are second to none. Duncan Aviation was founded as a Beechcraft Distributorship in 1956 and was literally built by serving the Hawker Beechcraft customer. We have a long relationship with the Hawker Beechcraft family of aircraft, as well as their operators. To find out about our continued Hawker capabilities and services, feel free to contact me any time. I remain always at your service. Dan Fuoco serves as an Airframe Maintenance Service Sales Rep. specializing in Hawker aircraft at Duncan Aviation's Lincoln, Neb. (LNK) full-service facility. He began his aviation career in 1974.